Safeguarding is of utmost importance here at Longstone School. It runs at the heart of our values and aims; in fact it runs through everything we do. Checks made throughout the recruitment process by panel members trained in 'Safer Recruitment'. Checks made on individuals who contribute in Collective Worship sessions. We have embarked on a project to carry out a full audit of our e-safety safeguarding procedures, policies and practices. This project is very thorough and will take severla months to implement fully. We have a working party who are tackling this which is led by Miss Hodkin and attended by staff and governors. If you would like to be part of this, we welcome any input. Just speak to Miss Hodkin about lending your support! First and foremost we TALK to our children about current issues relating to safeguarding. We discuss concepts such as 'stranger danger' whether that be in the playground, or online. Through discussion we ​raise awareness and keep pupils safe from the dangers of abuse, sexual exploitation, radicalisation and extremism. We tackle these issues in an age appriate and sensitive way. We work in conjunction with organisations such as the NSPCC to educate children and give them the vocabulary they need to communicate and understand some of these concepts. ​Earlier this term we welcomed Traci Good to speak to children and parents about the newest developments. We get in contact with her regularly to develop our knowledge of the newest trends. 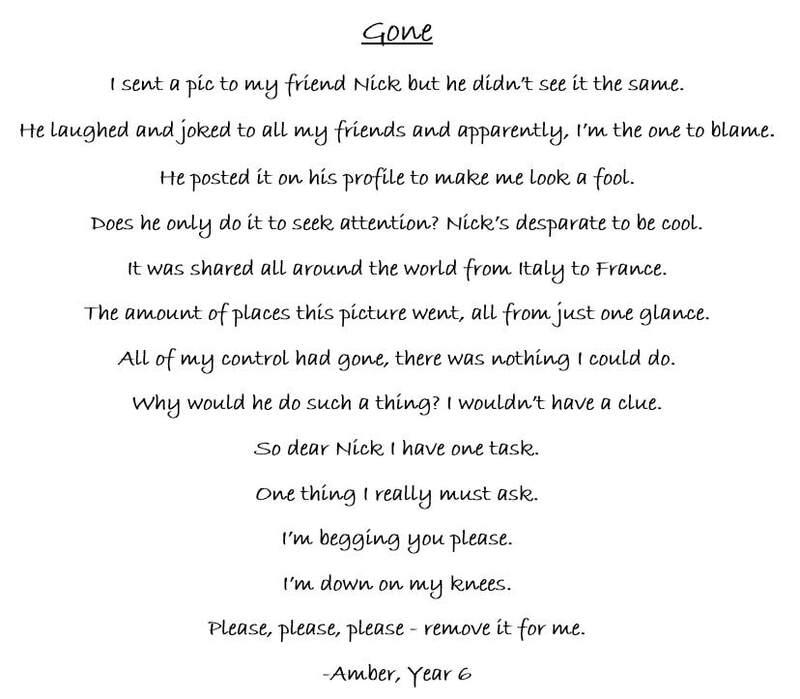 Here is a poem which was written on Safer Internet Day by Amber, one of our year 6 pupils. It is about the impact of images being posted onto social media. Click below to see what we got up to on Safer Internet Day! It's really tricky to keep up to date with all the current information about online safety. As soon as you're trained up, it feels like you're already out of date! You can click on the links below which will take you to online resources to keep you up to date with everything you need to know.